Two-way synchronization between Outlook and Google Calendar. You can choose synchronization direction between Outlook and Google Gmail Calendar. With two-way synchronization, changes made in one calendar will automatically be transferred to the other. 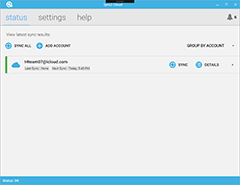 Sync Outlook with multiple Google accounts. 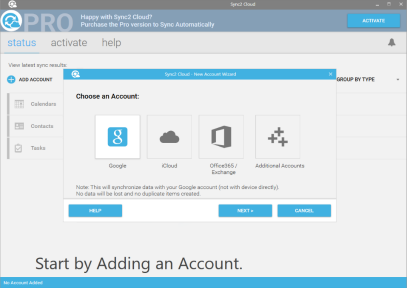 With Sync2 Cloud you can sync multiple Google Gmail accounts with Outlook. Edit all your calendars at once and share them with your family, friends or colleagues. You can choose what calendars to share, as well as privacy options. See your Google Calendar in Outlook. After synchronization between Google Gmail Calendar and Outlook, you will be able to see and sync your edits of Google Gmail Calendars and Outlook events and meetings. Easily share your Calendars with others using Google Gmail Calendar sharing feature. Select “Sync” to begin synchronization. In a few moments your Microsoft Outlook and Google Gmail Calendars will be synchronized. Fantastic product. Will save me hours of work!"